The Falls by Australian author B. Michael Radburn is the second in his Taylor Bridges series although it can easily be read as a stand alone. (The first novel in the series was The Crossing and you can see my review here). Taylor Bridges is a Park Ranger who is drawn into a local missing persons case in country Victoria. The novel is centred around a disused mine (pictured on the cover) and some of the scenes are almost cinematic in quality. Radburn really knows how to write about the Australian bush, and with a deadly bushfire scorching the earth, I could almost smell the ash at the crime scene and hear the tinkle of the glass apple trees in an orchard not too far away. I also experienced a jolt of recognition at the mention of Lakes Entrance and Bairnsdale and appreciated the familiar rural setting. Taylor makes for a refreshing protagonist and I don't know of any other author who has a Parks Ranger as their main character, but it works. My favourite character though by far was Gordo, the ex-Navy chopper pilot, and his unique expression made me smile every time I saw it on the page. (You'll have to read it to find out, no spoilers here). Radburn mentions in the Acknowledgements section that his daughter designed the cover of The Falls and I must day she's done an amazing job. The cover has an eerie quality to complement the storyline and the shiny (spot UV) Bendigo Tool Co. logo on the back is a touch of artistic genius. I recommend The Falls for fans of crime and mystery novels and those looking to discover more Australian authors. Readers in Victoria will enjoy it just a little more owing to the setting. 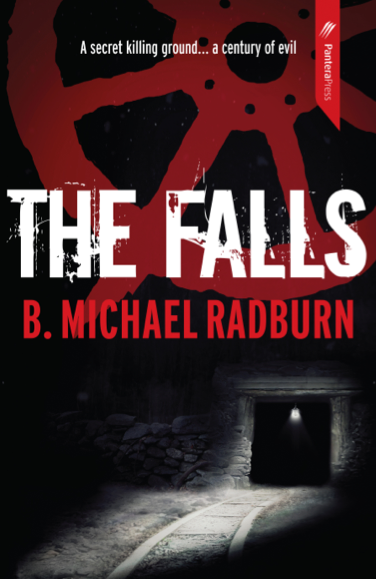 You'll have the chance to WIN your own copy of The Falls by B. Michael Radburn in a giveaway here on Friday 29 July 2016. I bought "The Crossing" because of your review, and loved it. I bought for copies for birthdays, Christmas for everyone I liked! I can't wait to read The Falls, and your review makes me only more impatient to sink into it!